uring his Dresden years (1843-49) Richard Wagner found many ideas for stage works in medieval literature. Some of those ideas he would develop into operas or music-dramas (such as Lohengrin, the Ring, Die Meistersinger and Parsifal) while others remained no more than possible subjects for musical and dramatic treatment (such as Wieland der Schmied). The starting point for Wagner's Der Ring des Nibelungen, as every Wagnerian surely knows, was a Middle High German epic, the Nibelungenlied. Wagner's studies for the Ring did not end there, however; he proceeded to read other medieval sagas, studies of medieval literature by scholars such as the Grimm brothers and not least the Old Norse Eddas. As far as scholars have been able to discover, Wagner's first contact with the myth of Parsifal was the poem Parzival by Wolfram von Eschenbach, which he read at Marienbad in 1845. The first opera that resulted from his reading of Wolfram was Lohengrin, which was in outline based upon the last section of Wolfram's poem. More than a decade later, when Wagner returned to Parzival ¹, he found (as he wrote to Mathilde Wesendonk) the poem unsatisfactory as the basis of an opera. As with the Ring, Wagner began to explore other versions of the same legend. Of the many versions of the Percevalian myth, at least three were available to him (in the 1860's and 1870's): Wolfram's Parzival (in various translations including that by Görres), Chrétien's Perceval (in the modern French translation by Potvin) and the anonymous Peredur (first in the French translation by de Villemarqué and later in a German translation by San-Marte). Left: Die heil'ge Quelle selbst... 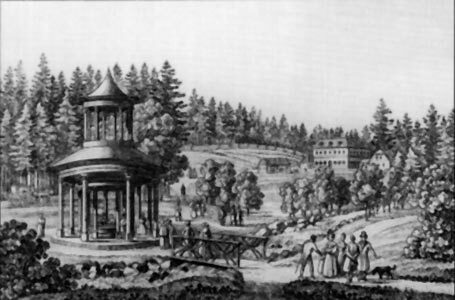 The Forest Well in Marienbad, drawn in 1840. Wagner came to this spa to drink the mineral waters in 1845.
olfram's work is based on an unfinished poem by Chrétien de Troyes, together with at least two other sources that have not survived. There is some evidence, although only at third hand, that Wagner had read Chrétien's Perceval: The Story of the Grail and its so-called Continuations, in a modern French version, in 1872. (This is mentioned in Du Moulin Eckhart's biography of Cosima, in which he records that Wagner had studied the Grail legend in Wolfram von Eschenbach and Chrétien de Troyes, and now again the remarkable and unique book by Görres, which is more invention than fact, has stimulated his creative processes ... ). hrétien had drawn upon a tradition of Celtic stories, including possibly an early version of Peredur son of Evrawc; or, alternatively, the tale of Peredur might have been based on an imperfect recollection of Chrétien's poem. This story appeared in the Comte de Villemarqué's Contes populaires des anciens Bretons,which Wagner is known to have read while in Paris in 1860. Chrétien's Perceval (or li Contes del Graal or Perceval le Gallois) roughly follows the story of Peredur (or the reverse) up to and including the meeting with the hermit on Good Friday. Wagner's Bayreuth library also contains a volume by San-Marte of tales from the Mabinogion (Die Arthur-Sage und die Märchen des rothen Buchs von Hergest). he same Celtic stories inspired other writings in which the Grail became a Christian symbol. This variation was also adopted by some of the authors who attempted to complete Chrétien's unfinished poem. Wagner may have found this interpretation, which he claimed for his own, there or possibly in a summary of another work: Robert de Boron's Joseph d'Arimathie. This poem tells the story of Joseph and his family, guardians of the Christian Grail; its first part is based on the apocryphal Gospel of Nicodemus. There are two sequels, the poems Merlin and Perceval, the second of these either not written by de Boron or completed by another hand. Although there is no evidence that Wagner had any direct knowledge of Robert de Boron -- whose writings were rediscovered in the early 19th century and first published in modern French in 1841 -- indirect knowledge of de Boron's work cannot be ruled out. rail romances were by no means the only sources drawn upon by Wagner as he developed his libretto. There are other works of literature (in various genres including poems, novels and scriptures) that beyond all reasonable doubt provided ideas for Wagner's libretto: three of them are the medieval romance Roman d'Alexandre, the religious poem Barlaam und Josaphat and the 19th century novel, Le juif errant. In a separate article the current author discusses the influence of the Buddhist literature of northern India on the text of Parsifal, with particular reference to two incidents in the opera that derive from these sources. agner was reticent about his sources, even dismissive of the influence of Wolfram. He told Cosima that Wolfram's text had nothing to do with Parsifal; when he read the epic, he first said to himself that nothing could be done with it, but a few things stuck in my mind - the Good Friday, the wild appearance of Condrie. That is all it was. In particular, he found the Question an unsatisfactory element of the plot. But Wolfram was without doubt important as a stimulus for his thinking and further reading. hen Wagner left Dresden in a hurry in 1849, he left behind him many books. The books were seized by his creditors and at auction most of them were purchased by Wagner's brother-in-law Hermann Brockhaus. A few were lost, if we are to rely upon a list of the Dresden books made by Minna Wagner: these included Karl Simrock's edition of Parzival and Titurel. Surprisingly, Wagner never negotiated the return of his Dresden books from his brother-in-law: so they remained in the archive of the Brockhaus publishing company for more than a century. Fortunately they survived the destruction of the second world war. The Brockhaus company asked Curt von Westernhagen to make a catalogue of the books2. The catalogue was published in 1966. Now the books are on display in the basement of the Wagner Museum in Bayreuth. he Dresden Library contains several books of medieval literature, including Karl Lachmann's edition of poems by Wolfram von Eschenbach (Berlin, 1833), as well as San-Marte's translations (1836-41) of Parzival and of other poems by Wolfram. It also contains Pfeiffer's 1843 edition of the German version of Barlaam und Josaphat by Rudolf von Ems. Vol. i: Le roman en prose. According to Sebastian Evans, in his Introduction, this translation of the anonymous Perlesvaus was made from the first volume of Potvin, published in 1866. Vol. ii-iii: Perceval, believed to be entirely by Chrétien de Troyes. 1866. Vol. iv: The First Continuation, an anonymous story about Gawain. There are several versions of this continuation. Although it is not present in the manuscript translated by Potvin, two of the manuscripts contain an interpolation that tells the same story as de Boron's Joseph d'Arimathie, although in much less detail. 1866. Vol. v: The Second Continuation, by one Gautier or Wauchier de Denain. According to Jessie L. Weston, the First and Second Continuations are not so much a completion of Chrétien, as a retelling of a Grail story in which Gawain, not Perceval, is the hero. Weston believed the original of this story to have been composed by a Welsh poet, Bleheris, Blihis or Bréri. The original ending was not included in the manuscript translated by Potvin, but it has survived in a single manuscript. 1868. Vol. vii: The Third Continuation, by Manessier, apparently derived in part from Perlesvaus and from the Quest of the Holy Grail. 1870.
he first point to note is that Lucy Beckett was wrong in her assertion that the Continuations were not differentiated in the text Wagner would have read ; they were published in separate volumes, and the change in style from volume iii to volume iv (since the First Continuation has the character of an oral recitation) would have been fairly obvious. But Beckett is correct when she writes that the First Continuation identifies the bleeding spear with that of Longinus, while the Second says that the cup contains the blood of Christ; important because neither of these features appear in Perceval . This interpretation of the Grail is also found in other versions of the story, although even in the early romances there is considerable variation in the concept of the Grail: according to Wolfram it is a stone that fell from heaven. uch more importantly, Wagner's bookshelf contains volume i, Perlesvaus. Although this account of the Grail legend has many parallels with Wolfram's poem (for example, in the emphasis on healing the Grail king -- the theme of the Waste Land is missing), it differs from the latter (and from Chrétien) in two important respects: the Grail king is not physically wounded, but has fallen into languishment , i.e. he is spiritually disabled; and there is a unique emphasis on the failure of the Quester. Both elements may be detected in Wagner's poem. noted in the accompanying article on Kundry, an interesting feature of Perlesvaus (also present in Peredur) is that the Grail-bearer and the Loathly Damsel (or High Messenger) are one and the same. The last point to note was made by Jessie Weston in her book From Ritual to Romance. In the manuscript translated by Potvin, the First Continuation states that the Grail-bearer weeps piteously. t is tempting to conclude that Wagner's version of the story was influenced by his reading of the first volume of Potvin. Unfortunately, however, none of Potvin was published before 1866, and we have Wagner's Prose Draft of 1865 which contains all of the elements mentioned above. If Wagner was familiar with Perlesvaus in 1865, it must have been as a result of reading secondary sources such as San-Marte's Parzival-study (1861). Wagner's Bayreuth library contains several books by San-Marte (the pseudonym of Albert Schulz). One of them contains extracts from Der jüngere Titurel, once thought to have been written by Wolfram von Eschenbach but later attributed to Albrecht von Scharfenberg: it is a continuation of Wolfram's unfinished poem Titurel and it relates the love story of Sigûne (Parzival's cousin) and Schionatulander. Summer 1845 Wagner reads Wolfram von Eschenbach's poem Parzival whilst on vacation. At this stage it is no more than one among many possible subjects for dramatic treatment. Wagner does not seem to have thought any more about Parzival until he considered introducing him into the last act of Tristan. 1843-48 Wagner reads Rudolf von Ems' translation of Barlaam und Josaphat. This appears as item no.8 in von Westernhagen's catalogue of Wagner's Dresden library. Pfeiffer's edition was published in 1843. Not earlier than 1850 Wagner reads, or reads about, the Roman d'Alexandre. Lamprecht's translation, of which there is a copy at Haus Wahnfried, was published in 1850. 1855 Wagner reads Arthur Schopenhauer's essay On the Basis of Morality and learns that the only viable basis of morality is compassion. The section of this essay concerning hunting is of direct relevance to the swan incident in Parsifal. Spring 1856 Following up a reference in Schopenhauer's On the Will in Nature, Wagner reads Eugène Burnouf's Introduction to the History of Indian Buddhism where he finds the idea of becoming wise through compassion -- and a story that becomes the scenario for a Buddhist drama, Die Sieger. 1856-57 In search of background for the further development of Die Sieger Wagner reads various accounts of the life of the Buddha Shakyamuni. He notes the parallels between the early life of the Buddha and the sheltered youth of Wolfram's hero Parzival. 1859 Wagner returns to Wolfram's Parzival. He writes to Mathilde saying that he can to nothing with this "thoroughly immature phenomenon". 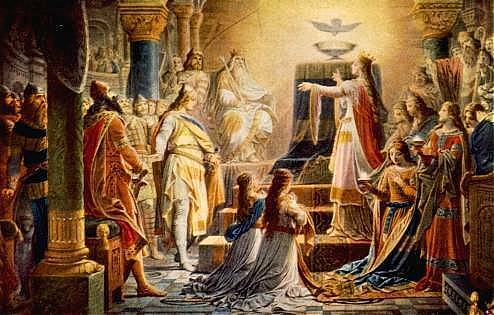 August 1860 In Paris Wagner reads the tale of Peredur son of Evrawc, in French. Not earlier than 1866 Wagner reads at least part of Robert Spence Hardy's Manual of Buddhism. This title first came to his attention when he read Schopenhauer's On the Will in Nature in 1855 (in the chapter headed Sinology there is a reading list about Buddhism; this book is item no. 24 on that list). His interest in the book would have been stimulated on reading about it in the third edition of Schopenhauer's The World as Will and Representation. 1860-77 Further reading about Buddhism, at first in secondary sources, later the Sutras in the edition of Coomara Swamy. Not earlier than 1866 Wagner reads Potvin's editions of the Perlesvaus and (in 1872 if not also before) of Chrétien's Perceval. Not earlier than 1868 Wagner reads Potvin's edition of the Continuations to Perceval. October 1872 Wagner reads the preface to Joseph Görres' edition of Lohengrin. Here he finds the hypothesis that the name Perceval/Parzival derives from the Arabic, "fal parsi", supposedly meaning, "pure fool". Therefore he changes the name of his hero to "Parsifal". 1872-77 Wagner reads diverse literature about the origins of Christianity, together with Church history. 1875 In search of details (such as names for minor characters) for the poem of Parsifal, Wagner reads San-Marte's Parzival-study but finds it of little help. 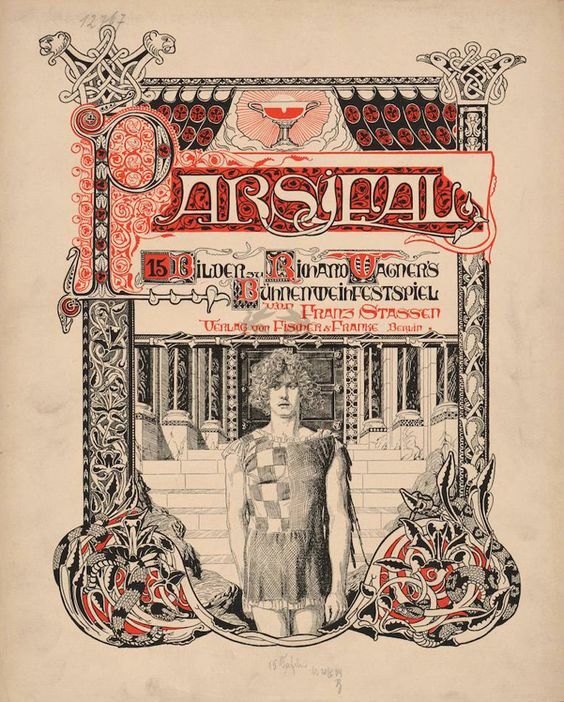 April 1877 Wagner completes the poem (libretto) of Parsifal. Footnote 1: In his autobiography Mein Leben (My Life) Wagner wrote: ... I suddenly said to myself that this was Good Friday and recalled how meaningful this had seemed to me in Wolfram's Parzival. Ever since that stay in Marienbad, where I had conceived Die Meistersinger and Lohengrin, I had not taken another look at that poem; now its ideality came to me in overwhelming form, and from the idea of Good Friday I quickly sketched out an entire drama in three acts. . So Wagner had not looked at Parzival since 1845, nor is there any evidence that he had read any other Grail romances during the intervening twelve years. What it was that Wagner sketched out in the inspiration of a spring morning in 1857 is the subject of a paper that is shortly to be published elsewhere. Here it is sufficient to note that Wagner only returned to Parzival two years later, after Mathilde Wesendonk had sent him a new edition of Wolfram's poem. Footnote 2: Richard Wagners Dresdener Bibliothek 1842-1849 : Neue Dokumente zur Geschichte seines Schaffens. Curt von Westernhagen, published by F.A. Brockhaus, Wiesbaden, 1966.